Bringing the forgotten sounds of Mzansi back with his record shop and reissue label AfroSynth Records. DJ Okapi also known as Dave Durbach is best known for his long-time running blog: "Afrosynth" which later grew into a record store based in Maboneng, Johannesburg, and also is run as a record label. He has been DJing since 2004, digging up rare vinyl grooves which explores South African 80’s bubblegum, kwaito and other music from the continent. 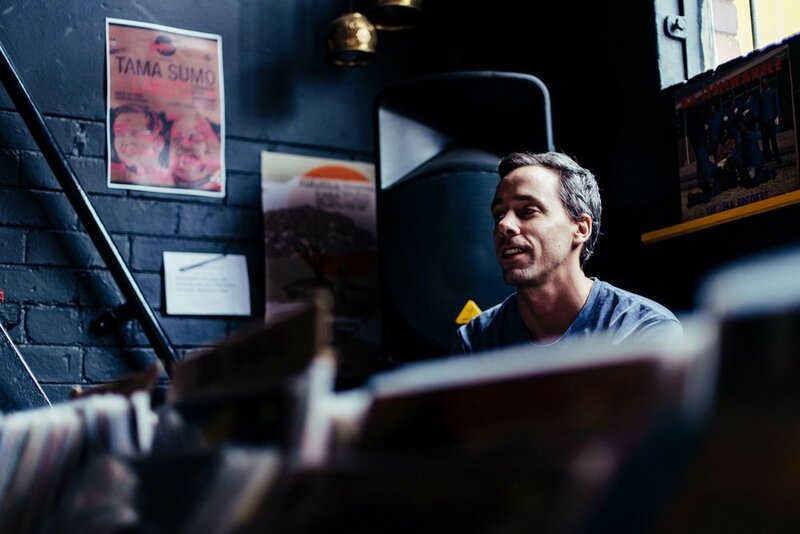 He has compiled collections of South African music for international labels like Cultures of Soul (2016), Rush Hour (2017) and Soundway (2018). Last year he formed part of major festivals abroad such as Dekmantel in Amsterdam and Dimensions in Croatia. Not so much a musical household but I was very much into music as a kid. For whatever reason I seem to remember spending most of my time either in my room listening to music, playing guitar or jamming on Fruity Loops or just chilling at the mall at the CD store. I grew up in Cape Town in the 90s, where there weren’t really records around, it was all CDs and cassettes. Records only came later, but I’d say I was always into music. Growing up primarily American music and British music, some South African music, but not really actively going at it until I started DJing, started collecting records and then I started finding more and more South African stuff and everything kind of fell by the wayside, and I started focusing on that. Where do you find your music that you DJ? I’ve been collecting for 12 or 15 years, that started in Cape Town, just collecting records and finding some records here and there. I moved up to Joburg in 2009 and when that happened, it was like the floodgates opened. I started being able to find a lot more South African music. Find a lot more musicians and producers from that era as well, to try and sit down and interview them. Learn about the music from that era. Then since I’ve opened the shop here, which has been about 2 years now, people come to me with records. So I don’t really have to go digging so hard anymore, thankfully people come to me looking to sell records to me or to trade records or whatever. What led you to opening the shop? Yeah, the shop was kind of the first step in making a living out of my passion. Before it was just a blog documenting my collection and just DJing as a hobby. Over the last few years, especially in Joburg, I started finding a lot of extra stock, so multiple copies. More and more people started coming to me looking for records to then sell on, on Discogs or whatever. So I realised I could easily get in on that as well. So I started doing that, first on Discogs. After about a year and a half of that I realised, why am I selling all the South African music to German DJs and Dutch DJs, this music should still be available to South Africans as well. I decided let’s set up a physical space here and make this music available to people in South Africa, because that’s always been a problem. This music over the years became invisible, so local people didn’t really take note of it or think about it and then people overseas started catching on to it and started pushing the prices of the records up to the point where local people couldn’t even afford it if they wanted it, and realising that was a bit weird. You also launched a reissue label? The label came after that. When I opened the store, records started coming a bit easier to me. I started getting more gigs overseas when I opened the store and started selling. And a natural extension of that was setting up the label. Because even before that I was in touch with the guys at Rush Hour in Amsterdam which is like a big record store and distributor. What Rush Hour does for a lot of young or small labels and collectors is help incubate or set up little labels by offering distribution deals or pressing a distribution deal. So they helped me out and said, we can help get music out there if you can just licence the music properly and all that kind of stuff. So the first one is ‘Burning Beat’. It’s really cheesy disco, it just sounds like a Donna Summer track or something, but there are two 11 minute songs. The production is really good but they’re not instantly recognisable as South African. The second release has just come out this week. It’s from the 90s, a band called Volcano, which were like a bubblegum band but they did a kwaito release in the early 90s. The b-side is this thing called the Beat Gangsters, a song called ‘Chappies’. That’s come out this week internationally. I basically have this thing with Rush Hour now where we have one thing on preorder and one actually released. The next release on pre-order is by a singer called Ntombi Ndaba. My favourite singer from that era. She’s a disco singer. Again, the cover that we’re using is a new cover, because the album itself is basically two songs from each of her solo albums. Ntombi is the project I’m putting the most effort into. The one I feel the strongest about. I managed to find the singer herself. She quit music in the 90s and she’s been living in her hometown which is a place called Mondlo outside Vryheid in Zululand, northern KZN. Her records are now going for a lot of money because lots of DJs are playing it. She hasn’t performed or been in the music industry since the early 90s, so she had no idea that people were into here music or people even know who she is, especially overseas. When I eventually managed to find her, obviously it was quite a emotional thing for her and I managed to convince her and persuade her that I’m her biggest fan basically and I’m trying to get her music out so that I can earn some money for her. She was cool, happy to go ahead with it. Thankfully in terms of licensing, she owned her own music. That’s third project and then four or five releases are kind of in the bag now. Hopefully out before the end of the year. So it’s all a combination of disco stuff from the 80s, and early kwaito stuff from the early 90s, obviously with the exception of the first release which was from ‘79, a little bit earlier and a little bit more American style. The fourth release we’ve lined up is like a dub version of the first release, with one or two extra tracks. The main track is actually not a South African one, it’s an italo-disco track from back in the day, which was quite a big sound in South Africa. So some of the Italian labels were sending promo copies to Music Team for example with the hope that they would license and release it locally, which they did sometimes. This one track in particular, it’s called ‘Dance’ and the artists are called Nightforce, and when they sent it to South Africa the guys at Music Team actually pitched it down and played it at 33 rpm when it was meant to be played at 45 rpm. They realised this and said for the South African market we have to release it at a slower tempo. They got special permission from the European dudes and they released it. So the South African track is much, much slower than the official original track, but it’s actually much better. So it’s kind of a weird story and in a way it’s indicative of a lot early South African dance music in general, always about pitching it down, not about pitching it up. That created a South African vibe. So in a way this release is in a nutshell representative of all South African dance music. I’ve got a lot of stuff on the horizon in terms of the releases and there’s such a wealth of South African music, there’s actually no end of music that could be re-released. It’s not just me, there are other small labels and bigger labels putting out old South African music too. Internationally Soundwave for example, locally there’s a guy in Cape Town who’s put out this album called Sharpflat. So the whole market is exploding but I think for people who want to get deeper into South African house music for example or massive fans of contemporary guys like Black Coffee or whoever, guys who want to trace that back to where it started, this is kind of where it started. It’s the first electronic dance music from South Africa. Before it was bands and in the 80s with this kind of stuff it was the beginning of the producers really taking center-stage. Has starting the label and being exposed to more local music had an effect on your DJ sets? It’s quite interesting actually because I think most DJs, there’s pressure on DJs to be diverse or adaptable. So you can play one set in a certain place to a certain crowd and maybe play a different kind of set depending on the context. But for me, I find that as people become more and more turned on to the South African stuff, and as the life of the store gets older and more established I kind of have to pigeonhole myself even more and become more specific. So back in the day I used to play a lot more American music, other African stuff, Nigerian stuff, whatever, but now I kind of feel on me to only play one type of music which I’m kinda happy with in a way, because I can kind of become a specialist in one sound and not try and have to have a few house records in case people start asking for house which has sometimes been the case. So I can just continue down my little rabbit hole and continue to specialise in this type of music and as my collection of that music grows I can become more diverse in that particular sound. Which is either bubblegum or kwaito, maybe one or two occasional American tracks, but very seldom any other African music. So my sound hasn’t changed necessarily, but I think I’ve become a bit more confident in pigeonholing myself and making myself a lot more narrow-minded which is a bit counter-intuitive sometimes to what some DJs think is expected of them and maybe is the truth. But for me being a specialist in this old music I can now thankfully only play this music I wanna play, whereas, in the past where I was only playing at Kitchener’s or only playing Joburg, there’d sometimes be pressure to have a plan B.